A Dubai-based real estate brokerage firm is offering a one-bedroom apartment in Princess Tower, the world’s tallest residential tower, for rent at Dh299 a day. According to the firm’s listing on a local classified website, the apartment is on 16th floor and has one bathrooms, a guest restroom, lounge, and a fully-equipped kitchen. “Residents have an access to facilities such as indoor and outdoor swimming pools, a gymnasium, a children’s play area, sauna rooms, private car park. The top floor provides gathering and recreational facilities to the residents,” the listing reads. The rate is valid only if the person is renting the unit for a minimum of seven days or longer, but the price rises to Dh350 a day for one to three day stay. Renting a one-bed apartment in the tower on a monthly basis costs around Dh12,000, while leasing on a 12-month contract averages Dh95,000 per annum or 7,917 per month. Dubai Tourism (formerly the Department of Tourism and Commerce Marketing) has told Emirates 24|7 that those renting apartments as holiday homes without license can face fines of Dh5,000. A report by property consultancy Core pointed out that higher floors in tall towers, especially in Dubai Marina, command over 20 to 30 per cent premium in the rental and sales market. 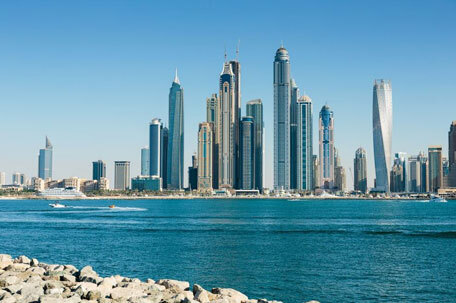 “Unsurprisingly, occupier decision making is principally driven by scenic sea views, thus, higher -floors attract premiums from both rentals and sales transactions, sometimes in excess of 20-30 per cent from the marina views,” the consultancy, which is the UAE associate of Savills, said. EC Harris, a global built asset consultancy, has previously termed the master development as the “tallest block in the world” as it houses 14 out of the 20 tallest buildings in the emirate. Dubai currently has 1,309 high-rises and 527 skyscrapers, Emporis, which collates data on building worldwide, data reveals.